Today marks day three of my vegan muffin roundup! On the cooling rack is a delicious surprise for all of you muffin traditionalists who think muffins only come in bran, blueberry and banana. Feast your eyes on Vegan Broccoli Muffins. I, like other food writers, overuse (torture) the phrase “these are great with a bowl of soup or a green salad!” when speaking of savory quickbreads such as this. Sorry. But it’s true, these are. I’ve been known to crumble one of these warm lovelies right into a cup of minestrone (it’s a peasant soup kind of thing). Yet these are equally smashing as a savory start to your day. Kevin thinks broccoli for breakfast is whackadoodle, but I’ll win him over one of these days. I’ve thrown a handful of vegan cheese in here, too, but it is your call–the muffins are equally yummy without it. If you do opt for cheese, be sure to cut it into cubes instead of shredding. That way you get the bubbly bursting blobs of cheese that make any cheesy bread worthy of its name. By contrast, shredded cheese tends to disappear into the batter without delivering a noticeable, cheesy punch. 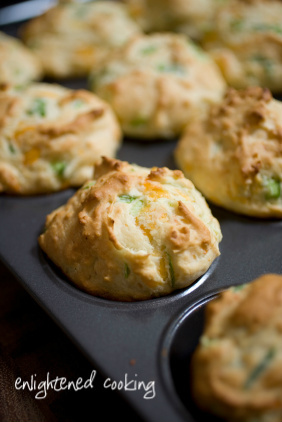 Deep-colored broccoli seems like something new in these rich, satisfying muffins, enhanced with green onions and a hint of Dijon mustard. Broccoli-Buying Tip: When purchasing broccoli, look for compact, tightly closed florets and thin-skinned stems that are on the slender side. Avoid broccoli that is dried or cracked on the cut end or that has obviously woody stems, and leave behind any yellowing specimens. If it passes the visual inspection, take a whiff: broccoli should smell fresh, not strong and cabbage-like. Store it in a loose (unsealed) plastic bag in the refrigerator crisper. It will keep for a few days, but you should use it as quickly as possible, before the florets start to deteriorate. Hi, I just made these following your recipe exactly, except I used dairy cheese (I’m vegetarian but not vegan). I’m sad to say they didn’t turn out tasty at all. They looked white, almost like a biscuit (not pretty and golden like yours) after cooking except for where the cheese bubbled out. The toothpick came out clean and I cooked for a extra 10 minutes but it was just off. I’m so curious as to what went wrong! I really wanted to like these! Oh no, that is so disappointing when baked goods don’t turn out 🙁 I’m so sorry. This is one of my go-to muffins, so I’m trying to figure out what could have gone wrong. It may be that your oven temperature is off. I can;t understand how the muffins could still be white, not golden, after being in the oven for almost half an hour at 400 degrees (which is high for baking). i am tryng to go gluten free-can i substitute almond or flaxseed flour for the all purpose flour??? (1) I wouldn’t go 100% almond flour or 100% flax meal–perhaps 50/50. Almond flour is heavier than regular flour;it definitely needs some lightness in vegan baked goods for it to “work”. These look yummy! My 5 year old son is dairy and egg allergic, and does not love any vegan cheese substitutes we have found. What do you think about using nutritional yeast in place of the cheese? I eat low gluten too. After discovering that gluten free flour mixes are basically just starch, I found a site that recommends 30% starch (eg tapioca starch) and 70% wholegrain and/or garbanzo or soy flour. I use mostly brown rice flour and tapioca starch for my mix, which works quite well. I’m going to try these with my gluten free mix – I’ll let you know how they go! Oh wow! Yep, it works! I also added a tablespoon of savoury yeast flakes for added cheesyness and used two teaspoons of onion powder because I didn’t have scallions. It didn’t rise well but GF flour often doesn’t, but oh my, this is the best savoury muffin I’ve ever eaten! whoohoo!!!! Thanks for your experimentation! I am sure this will really help a lot of other readers, too! These turned out great! We used a gluten-free blend and we sauteed the broccoli first before adding to batter. We had to cook the muffins way longer though – about 30 minutes. Not sure if needed for others using GF flour. Used more salt than was called for our batch – we like savory! .Had nice flavor when warm but was even better when completely cooled. We didn’t use cheese (because we’re vegan) and we thought it still had a cheesy taste to it! It’s been awhile since we’ve had dairy though so could be just us:) Thanks again…this was awesome! We made again same as last time but with a couple of slices of finely diced jalapenos and a 1/2 tsp. of onion and garlic powder. Told you we like savory:) We also put a tiny little broccoli floret (sauteed first) in the center so when you cut in half there is a little tree! Such a great recipe. We love it! Thanks again. YUM! I jalapenos 🙂 What a cute idea with the broccoli “trees”! These are awesome! I was looking for an easy recipe for a muffin with vegetables. I made them according to the instructions and added two handfuls of grated zucchini. Fantastic and easy! Just made these for the first time. They came out amazing!!! Thanks for the great recipe! Wonderful! Thanks for posting, Marshall!